David, a co-director of Mitcham Rehab & Marion Sports Physio, graduated in 1987 & worked at the Royal Adelaide Hospital. He started at Mitcham Rehab Clinic in 1988 & developed the Physiotherapy practice to provide a wide range of therapies associated with management of musculoskeletal injuries & conditions. He completed a Master of Physiotherapy at UniSA in both Sports & Musculoskeletal physiotherapy in 1995 & has continued to lecture & tutor in this internationally recognised course on clinical exercise prescription, tendon & bone injuries, clinical pathophysiology & sports physiotherapy. 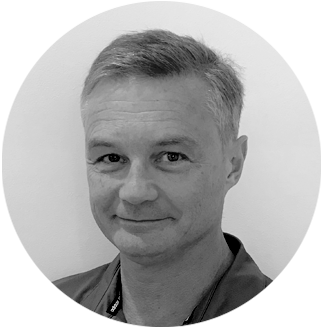 David has worked extensively with athletes at the Australian Institute of Sport (AIS) & the South Australian Sports Institute (SASI) & was a physiotherapist at the 1996 Melbourne Commonwealth Games & the past four Paralympic Games. David is currently a team physiotherapist to Australian Swimming. David has completed a Clinical Doctorate in Physiotherapy through La Trobe University & has a research interest on tendon, bone & children/adolescent injuries. In a way we are magicians. We are alchemists, sorcerers and wizards. We are a very strange bunch. But there is great fun in being a wizard.